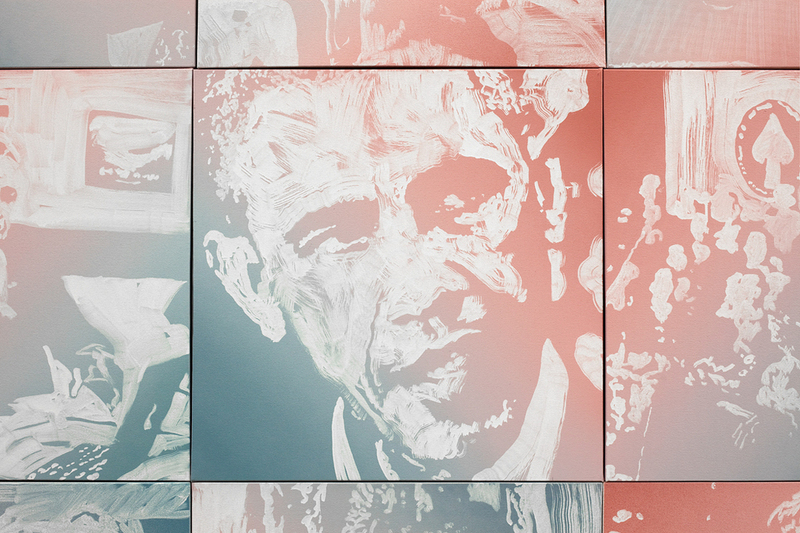 The process for creating each work in The Obama Paintings was the same: a canvas was covered in a spectrum of red to blue; once an image was selected, often for its aesthetic qualities and composition, Pruitt painted it in white expressionist brushstrokes onto the background. This meditative process is further emphasized by the installation of the unframed works in a non-chronological, seamless grid. The expansive work incorporates the full scope of Obama’s presidency, from such seminal events as his first State of the Union address to seemingly mundane activities such as walking the dog or spending time with his family. Each canvas is given equal importance, regardless of the traditional metrics of newsworthiness of the moment it depicts. Rob Pruitt’s The Obama Paintings serves as a monument in and of itself, as well as an examination of presidential monuments in general. The work considers the dissemination of images of past presidents and how they function in our society. The Obama Paintings is intended to be seen as a full picture of Obama’s two terms in office, presented not in chronological order, but rather as an integrated picture of the entire presidency.